Looking to live in luxury in one of the best cities in the country? 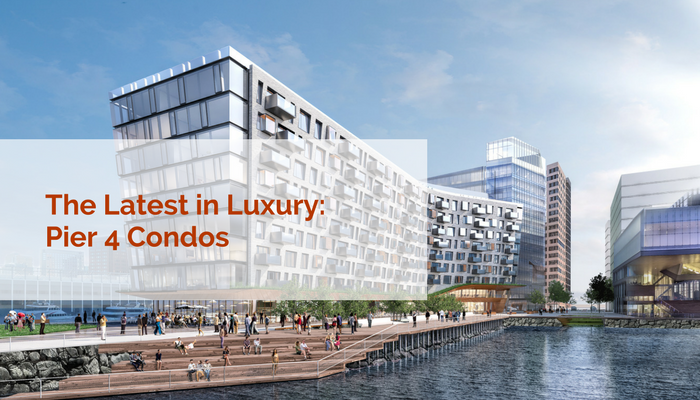 We have just the thing: Pier 4 Condos located in the Seaport District. This nine-story residential building features 106 luxury condo residences and 17,000 sq. ft. of retail space on the ground level. These condos have all family sizes covered: with one-, two-, three- and four-bedroom units to pick from. Imagine enjoying the breathtaking view of the harbor from your private terrace! If you decide on the penthouse suite, you can lounge on your private roof deck, relax with a drink, read a book, or entertain friends. You don't have to wait long for Pier 4 Condos, as they will debut in the fall of 2018. Pricing is in line with the red-hot Seaport District market. One bedrooms consisting of 960 square feet will go for $1.65 million and up, while two bedrooms and two baths at 1300+ square feet will go for $2.2 million and up. Wondering what you get for that price? How does white-glove personal concierge service with 24/7 availability sound? With that, you get catering and private chef services, in-home plant care for when you're away from home, as well as a convenient messenger service. If you're a fitness buff and like to stay in shape, you're in luck because there's an on-site site gym and yoga studio. For a bit of fun, try The Fairway--a golf simulation room, or hang out in the private residence club lounge flanked by outdoor terrace for awesome harbor views. When the weather is nice, eat in the cozy dining area complete with fire pit. And if you are a pet lover, there's a Dog Spa and an on-site dog washing room. To top it all off, Pier 4 Condos come with garage and valet parking. Featuring rich walnut hardwood flooring throughout, your Pier 4 Condo will feature neutral color schemes that you can leave as is or decorate as you like. In the kitchen, cook and entertain on top-of-the-line appliances, including stainless steel everything and even a wine refrigerator. Choose from two kitchen decors: wood accents or white. Enjoy even better amenities in the penthouse units, which feature upgraded kitchens, higher ceilings, and direct access to private rooftop terraces. Get plenty of natural sunlight through the massive floor-to-ceiling windows. Relax in luxury with your Tuscany white marble and porcelain tile master bathroom. Every unit at Pier 4 Condos has an incredible view, as it's surrounded on three sides by water. You don't have to walk far to get cultured, as the Institute of Contemporary Art on the Boston Harbor is just a few steps away. Meticulously designed and centrally located, you're in close proximity to the bustling Financial District, downtown Boston, and Beacon Hill. With the natural beauty of Boston's skyline as the backdrop, you can't go wrong with this luxury living paradise. For spectacular world-renowned dining, visit the North End; for the best in shopping, head to Faneuil Hall. And don't forget Fenway Park for Red Sox games or TD Garden for Bruins and Celtics games. Sound like a place you want to live? Contact Elevated Realty to learn more about Pier 4 Condos at 617-701-6300.